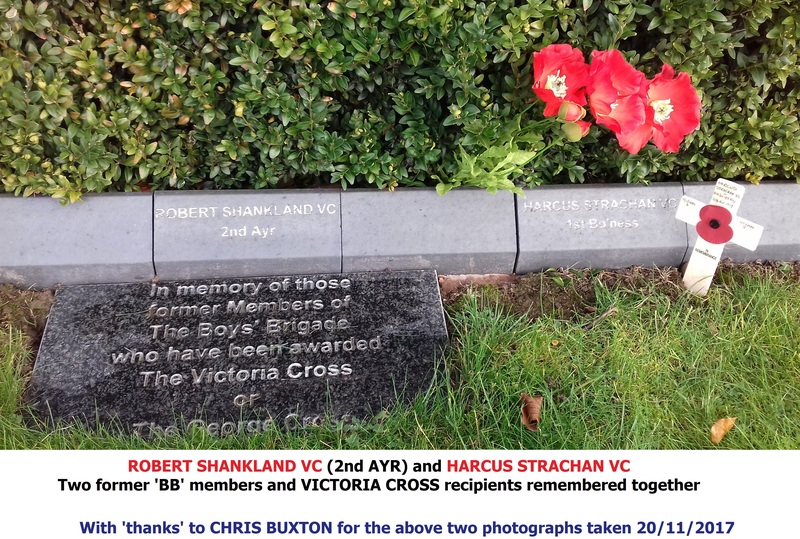 The Victoria Cross and George Cross and those BB members to whom it has been awarded. On 21st May 2016 a new border was dedicated at the BB Memorial Garden at the National Arboretum which details the names of the 16 former BB members awarded the Victoria Cross and 1 who was awarded the George Cross. Should anyone looking at this site know of any other former BB members who hold the Victoria Cross or George Cross, not listed below, can you let me know, so I can pass the information on. In 2015/16 I think it was, I read an article which stated, 'that since it was first awarded in 1854 (at the last count, which I assume was at some point in 2014) there had been 355 VC's awarded including 3 occasions when a 'bar' was awarded too; of that total figure awarded, 16 (yes, sixteen) are to former BB members'! Can I start by thanking a few people who have helped bring this page to this site. Firstly to Phillip Stallard (London Stedfast Association and Bugles & Drums of The Stedfast Association member) who wrote the original article with the assistance of Rob Bolton (also London Stedfast Association and Bugles & Drums of The Stedfast Association member). A word of 'Thanks' also to London Stedfast Association who ran the article in part about 3 of the recipients, in their magazine 'The Onlooker'. The first award was during the Anglo - Boer War, and was to Sergeant Donald Farmer, who had been a member of the 12th Edinburgh Company and served with the 1st Battalion, The Queen’s Own Cameron Highlanders. Sergeant Farmer was awarded his Cross when, on December 13, 1900, General Clements' camp at Nooitgedacht was attacked by a large force of Boers, Lieutenant Sandilands, of the Camerons, took fifteen men and went to the assistance of a picket which was hard pressed, having lost as in killed or wounded the greater number of its men. The enemy, posted behind trees, opened fire on the little party at about twenty yards range, killing two men and wounding five, including Lieutenant Sandilands. Farmer at once went to the officer's assistance, and, under a very heavy fire, carried him to shelter, after which he returned to the fighting-line, being, with the rest of his party, after a desperate resistance, taken prisoner. The Victoria Cross awarded him for this humane act was presented to him by HRH the Duke of York at Pietermaritzburg, on August 14 1901. The vast majority of awards (eleven) were made as a result of gallantry during the First World War. The first was awarded in the first few months, to Lance Corporal Frederick Holmes, a former member of the 62nd London Company, who was serving with the King’s Own Yorkshire Light Infantry. Soon after arriving in France with the British Expeditionary Force, Holmes was involved in fighting at Le Cateau on 26 August 1914. 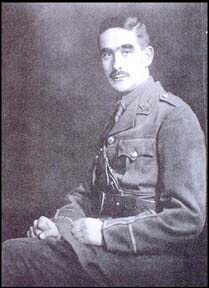 When his colleague Norman Woodcock was badly wounded, Holmes carried the 12 stone man on his back for two miles until he reached some stretcher bearers. Holmes returned to his battalion to find many of them killed or wounded. He placed a wounded man on one of the horses of a artillery gun team and attempted to take him to safety. Unfortunately the man fell off and was lost in the dark. Soon afterwards Holmes was so badly wounded that he came close to having his leg amputated. The next award was to Lieutenant John (Jack) Dimmer, formerly of the 1st Barnet Company, serving with the King’s Royal Rifle Corps. John Dimmer (known by his family as Jack), was one of four sons of John Dimmer, a railway worker. He was born in South London on 9th October 1883 (five days after the BB!) and spent his boyhood in Wimbledon. When he left school at the age of fifteen he worked briefly in an Engineer’s Office, but had a hankering for the military life. 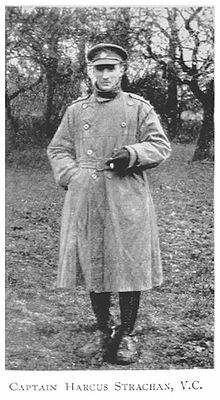 He was initially to serve with the Kings Royal Rifle Corps, and in 1900-1901 he joined the 1st Cadet Battalion of the KRRC Militia and was made a Sergeant when still only seventeen years old. In 1902 he joined the regular battalion of the KRRC and won prizes for drill and shooting and for other military work, and was made a Lance Corporal and later a Corporal and a Lance-Sergeant. At the end of 1906 he attended an officers examination and passed with high marks, but it was not until January 1908 that he was finally recommended for a commission. He was called up on the outbreak of the First World War, by which time he had had twelve years service, six as an officer, and was already 31 years of age. He was to see more active military service in the Kings Royal Rifle Corps, which he joined on 19th November 1914. Lieutenant Dimmer was awarded the Military Cross in October 1914 for devotion to duty and for gallantry displayed on many occasions, but his finest achievement was still to come. At the end of 1914, the KRRC moved down to the La Bassee front in Belgium, and took over the trenches at the Cuinchy Brickstacks. As the German Prussian Guard advanced in massed formation from the cover of a wood at Klein Zillebeke on 12th November 1914, the British machine-guns mowed them down with a storm of bullets. However, the gun which Lieutenant Dimmer was working, suddenly jammed. With great bravery he climbed onto the emplacement to put it in order, and while doing so a rifle bullet struck him in the jaw. He continued, however, to work the gun until it jammed once more, and while putting it in order he was hit in the shoulder. After again getting the gun to work, three shrapnel bullets struck his injured shoulder, but he most gallantly continued working it until it was destroyed by shell-fire. His magnificent courage and tenacity were awarded with the Victoria Cross. the Lieutenant Colonel of the 2nd Battalion King's Royal Rifle Corps. He fell whilst leading his Battalion on 21 March 1918 at the commencement of the great German offensive, at Marteville, north-west of' St. Quentin, being shot through the head in the act of ordering his men to charge. Dimmer mounted a white charger during the fighting – somewhat conspicuous on the battlefield – and was killed shortly afterwards. Buried by the Germans, his grave was recovered from an isolated spot on the battlefield after the war. The next award was made to Private John Caffrey, formerly of the 12th Nottingham Company, whilst he was serving with the York & Lancaster Regiment on 16 November 1915. John Caffrey was born at Birr, King's County (later Offaly), Ireland, on 23rd October 1891. He left Ireland at an early age and settled in England and was educated at St Mary's Catholic School, Derby Road, Nottingham. He enlisted into the army in 1910 and joined the 7th Battalion, Nottinghamshire & Derbyshire Regiment. Later, at his own request, he transferred to the 2nd Battalion, York & Lancaster Regiment in which his father had served. Upon the outbreak of the First World War Caffrey was mobilized on 4 August 1914, sailed for France on 8 September and went into action with his battalion on the 21 September. The 2nd Battalion, York & Lancaster Regiment moved into the Ypres salient on the night of 31 May/1 June 1915. By the end of August the battalion had received four drafts of replacements numbering 340 men, bringing it back up to strength after a previous attack at Hooge. On the evening of 15 November 1915, the 2nd Battalion York & Lancasters returned to the trenches, this time at La Brique. The next day was fine and bright and it was here that Private John Caffrey earned his Victoria Cross. 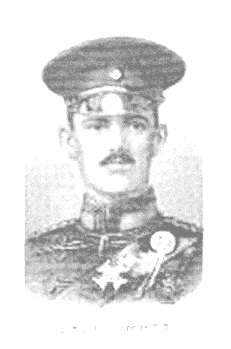 John Caffrey was invested with his Victoria Cross by King George V at Buckingham Palace on the 23 February 1916. He later achieved the rank of Lance Corporal. He died at Derby on 22 February 1953. A ceremony was held in Wilford Hill Cemetery, Nottingham on 23 May 2007, to place a new headstone over the grave, as the previous stone recognised Caffrey's parents but did not display his own name. Two local men, Sean Westerby and Ron Booth, decided to raise funds to replace the original stone, which was deteriorating badly, with a new headstone which would recognise John Caffrey as being a holder of the Victoria Cross. The fundraising was concluded successfully with the unveiling of the new headstone. His Victoria Cross is displayed at The York & Lancaster Regiment Museum at Rotherham, South Yorkshire. Second Lieutenant Edgar Miles, who had been a member of the 17th South Essex Company, and was serving with the Welch Regiment (but attached to the 9th Battalion, The Worcestershire Regiment), was awarded his Cross on 9 April 1916. He was born at Wanstead, Essex on 29 July 1894, and enlisted into The Worcestershire Regiment on 20 August 1914. He was discharged in the rank of Lance-Corporal on 20 November 1914 on appointment to a temporary commission as a Second Lieutenant in The Worcestershire Regiment. Promoted to Lieutenant in the Regiment on 22 July 1915 he was then given a regular commission in The Welch Regiment as a Second Lieutenant on 7 January 1916 with seniority from 4 December 1915. He was transferred to The Worcestershire Regiment in the rank of Second Lieutenant. The action during which Second Lieutenant Miles was awarded his Cross took place at Sannaiyat in Mesopotamia. Following a night attack and enemy counter-attack many dead and wounded lay between the lines. Several brave attempts were made to help the wounded and Lieutenant Myles dashed out a number of times to bring in wounded men, staggering in with the last despite having been wounded himself. The citation reads: "Edward Kinghorn Myles, Lieutenant, The Welch Regiment for most conspicuous bravery. He went out alone on several occasions in front of our advance trenches, and, under heavy rifle fire and at great personal risk, assisted wounded men lying in the open. On one occasion he carried in a wounded officer to a place of safety under circumstances of great danger." Early November 1916 the Army Commander General Sir Stanley Maude presented the ribbon of the Victoria Cross to Lieutenant Myles for his bravery in the Tigris Campaign. He was promoted to Lieutenant on 12 January 1917, and on 25 January 1917, still serving with the 9th Battalion at Kut-Al-Amara and an acting Captain, he was created a companion of the Distinguished Service Order. The Citation for this reads: "For conspicuous gallantry and devotion to duty. When all the officers except two had become casualties, he, for five hours, inspired confidence in the defence against two counter-attacks and sent back most accurate and valuable reports of the situation. His courage and fine example were largely responsible for the steadiness of all ranks under him." In this action he was wounded. He was also twice mentioned in despatches. Following the War, he was transferred to The King's Liverpool Regiment on 9 May 1923. Promoted to the rank of Captain on 22 February 1925, he retired on 10 March 1928, but was re-employed for some months in 1939/1940. Captain Edgar Kinghorn Myles, VC, DSO, died at Bishopsteignton, Devon, on the 31 January 1977 at the age of 82. Captain Myles' funeral took place at Torbay and he was buried at the Crematorium, Torquay. In November 1960 his Decorations and medals were bought by The Worcestershire Regiment and are now on display in the City Museum in Worcester. 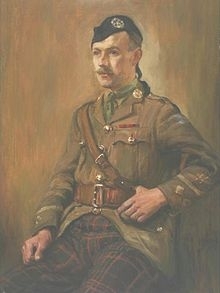 The first Scot to be awarded the VC was Drummer Walter Ritchie, formerly of the 44th Glasgow Company. 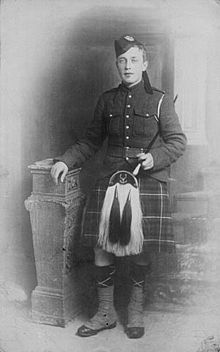 Walter Ritchie was 24 years old, and a Drummer in the 2nd Battalion, The Seaforth Highlanders (Ross-shire Buffs, Duke of Albany's), when the deed took place for which he was awarded the VC. 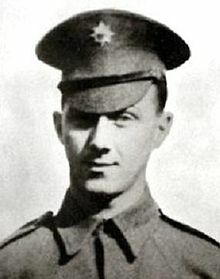 On 1 July 1916, north of Beaumont Hamel, France, Drummer Ritchie, on his own initiative, stood on the parapet of an enemy trench and, under heavy machine-gun fire and bomb attacks, repeatedly sounded the "Charge" thereby rallying many men of various units who, having lost their leaders were wavering and beginning to retire. He also, during the day, carried messages over fire-swept ground. He later achieved the rank of Drum-Major. Born in Glasgow in 1892, he died in 1965 and is buried in Edinburgh. The next award was made to a former member of the 2nd Rutherglen Company, who was claimed by both Canada and Scotland as “one of their own”. This was Piper James Richardson, who although being born in Glasgow, was serving with the 16th (Canadian Scottish) Battalion, Manitoba Regiment, Canadian Expeditionary Force. James (Jimmy) Cleland Richardson was born on 25 November 1895, in Bellshill, Glasgow. He was 20 years old when the following deed took place for which he was awarded the VC. During the Battle of the Ancre Heights on 8 October 1916 at Regina Trench, Somme, France, the company was held up by very strong wire and came under intense fire. Piper Richardson, who had obtained permission to play the company 'over the top' strode up and down outside the wire playing his pipes, which so inspired the company that the wire was rushed and the position captured. Later the piper was detailed to take back a wounded comrade and some prisoners, but after proceeding some distance he insisted on turning back to recover his pipes which he had left behind. He was never seen again. Although his body was never found, his memorial is at the Adanac Military Cemetery, France, 6 miles north east of Albert. James Richardson's bagpipes were believed to have been lost in the mud of the Somme for almost 90 years until 2002, when the Pipe Major of The Canadian Scottish Regiment (Princess Mary's) responded to an Internet posting. He discovered that an elementary school in Scotland had possession of a set of bagpipes with the unique Lennox tartan on them, the same tartan used by the pipers of the 16th (Canadian Scottish) Battalion. A British Army Chaplain, Major Edward Yeld Bate, had found the pipes in 1917 and brought them back home after the war to a school in Scotland where he was a teacher. The pipes were unidentified for several decades, and served as a broken, mud-caked, and blood-stained reminder of an unknown piper from the Great War. The collective effort of several Canadian citizens led to conclusive evidence that identified the pipes as those played by Piper Richardson on that fateful day in 1916. An anonymous donor facilitated the purchase of the pipes on behalf of the citizens of Canada. In October 2006, a party of dignitaries visited Scotland and received the pipes from the Headmaster of Ardvreck School for repatriation to Canada. On 8 November, 2006, the bagpipes were officially repatriated when troops from The Canadian Scottish Regiment (Princess Mary's) placed them at the British Columbia Legislature as a reminder of a generation's valour. They are currently on public display. The Glasgow Battalion of The Boys’ Brigade contributed many current and former members to the Highland Light Infantry during the First World War. One of those men was a former member of the 2nd Dumbarton Company, Acting Lance Corporal John Brown Hamilton. Born on 26 August 1896 in Dumbarton, by 25 September 1917 John Brown was serving with the 1st/9th Battalion of the Highland Light Infantry. During an enemy attack north of the Ypres to Menin Road, Belgium, difficulty was encountered in keeping the front and support lines supplied with small-arms ammunition. Several times he carried bandoliers of ammunition in full view of enemy snipers and machine gunners. He inspired all who saw him. Later promoted to Sergeant, John Brown died on 18 July 1973, in East Kilbride, and was cremated at Daidowie Crematorium, Glasgow. Just over a year after Piper James Richardson was awarded his Cross, a second award was made to a Scottish Canadian. This was to Lieutenant Robert Shankland, whilst he was also serving with the Manitoba Regiment, Canadian Expeditionary Force. Born in Ayr, on October 10, 1887, Robert Shankland was the son of a railway guard, and became a member of the 2nd Ayr Company. His first job was that of a clerk in the stationmaster’s office, but he moved to Canada in 1910 where he worked as assistant cashier for the Crescent Creamery Company in Winnipeg. When the First World War broke out he joined the 43rd Battalion (Cameron Highlanders of Canada) Canadian Expeditionary Force as a private. Awarded the Distinguished Conduct Medal for his actions at Sanctuary Wood in 1916 as a Sergeant (in charge of a stretcher bearer party), Shankland received a battlefield commission later that year and continued to serve with the 43rd Battalion. Following the war, Shankland stayed in the Militia with the Camerons and in his civilian work served as secretary-manager for several Winnipeg firms. 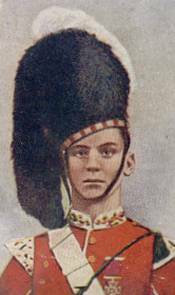 He eventually moved to Victoria and joined the Canadian Scottish Regiment. When the Second World War started, he returned to Winnipeg and rejoined the Camerons. Now a Major, he went overseas with the battalion as Officer Commanding Headquarters Company. Due to his age (53) he was too old for combat duty. Promoted to Lieutenant Colonel, Shankland was appointed camp commandant of the Canadian Army Headquarters in England in December 1940. In 1946, Shankland retired from the Army and became secretary of a leading securities firm in Vancouver. He died on 20 January 1968, at Shaughnessy, Vancouver, and his body was cremated and his ashes scattered in the grounds of Vancouver's Mountain View Cemetery. As well as Robert Shankland, two other holders of the Victoria Cross (Frederick William Hall and Leo Clarke) lived on Pine Street in Winnipeg, Manitoba, Canada (although not at the same time). It is believed to be the only street in the world to have three Victoria Cross winners who lived there. The city later renamed it Valour Road in their honour, and a bronze plaque is mounted on a street lamp at the corner of Portage Ave and Valour Road to tell this story. The medal is currently not on public display, although Shankland's battledress blouse with ribbons and his miniatures are on display in the Cameron's museum in Winnipeg. A third Canadian/Scottish award was made to Lt Harcus (Henry) Strachan of the Fort Garry Horse following an action on 20 November 1917. 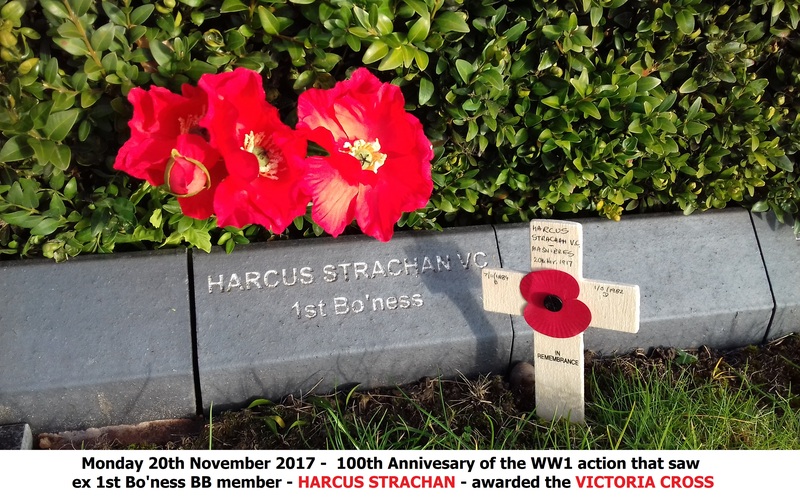 Born in Bo'ness on November 7, 1884, Harcus (Henry) Strachan attended the Royal High School, Edinburgh and was a member of the 1st Bo’ness Company, Scotland. At the time of the award, Strachan was 33 years of age, and serving with the Canadian Expeditionary Force as a lieutenant in The Fort Garry Horse. During the Battle of Cambrai on 20 November 1917 at Masnières, France, Lieutenant Strachan took command of a mounted squadron when the squadron leader, approaching the German front line at a gallop, was killed. He led the squadron through the enemy line of machine-gun posts and then, with the surviving men, led the charge on the German battery, killing seven of the gunners with his sword. When all the gunners were killed and the battery silenced, he rallied his men and fought his way back at night on foot through the enemy's lines, bringing all unwounded men safely in, together with 15 prisoners. After the war, he farmed in Edmonton before going into banking. He later commanded the 1st Battalion, Edmonton Fusiliers during the Second World War. After the war he retired and moved to Vancouver. Henry Strachan died on 1 May 1982, and is buried in Forest Lawn Memorial Park, Burnaby, British Columbia. It has become traditional for the Garrys to hold a parade every year on the anniversary of Strachan's unlikely cavalry exploit. The final awards in the First World War were made as a result of actions during the last six months of the war. The first was to Temporary/Second Lieutenant Ernest Beal of the Yorkshire Regiment (Alexandra, Princess of Wales's Own). Ernest Beal was born on 27 January 1885 to John and Jane Stillman Beal, who lived at 55 East Street Brighton. He was a member of the 13th Brighton Company, and was awarded his Cross as a result of an action at St Léger, France on 21/22 March 1918, when he was 33 years old. The citation for the award reads as follows: “For most conspicuous bravery and determined leading when in command of a company detailed to occupy a certain section of trench. When the company was established, it was found that a considerable gap of about 400 yards existed between the left flank of the company and the neighbouring unit, and that this gap was strongly held by the enemy. It was of vital importance that the gap should be cleared, but no troops were then available. Organising a small party of less than a dozen men, he led them against the enemy. On reaching an enemy machine gun, Second Lieutenant Beal immediately sprang forward, and with his revolver killed the team and captured the gun. Continuing along the trench he encountered and dealt with another machine gun in the same manner, and in all captured four enemy guns, and inflicted severe casualties. Later in the evening, when a wounded man had been left in the open under heavy enemy fire, he, regardless of danger, walked up close to an enemy machine gun and brought in the wounded man on his back". 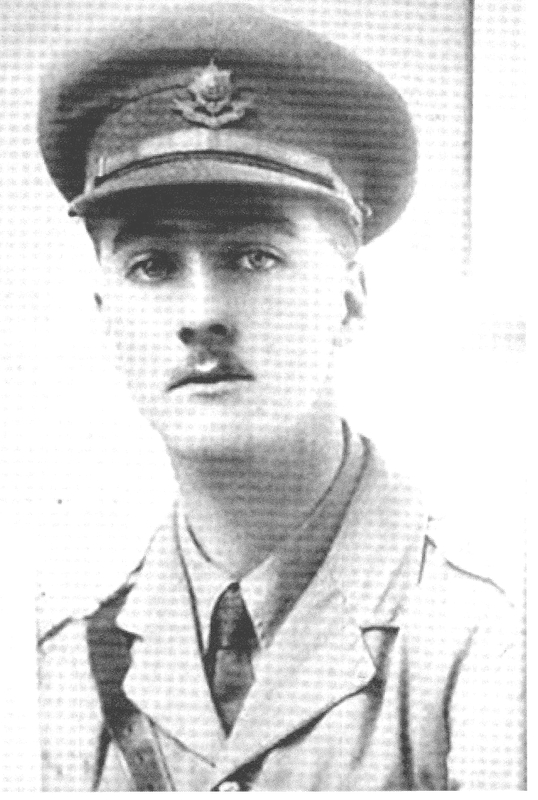 Second Lieutenant Beal was killed by a shell on the following morning. His name is listed on the Arras Memorial to the Missing in Pas-de-Calais, France. 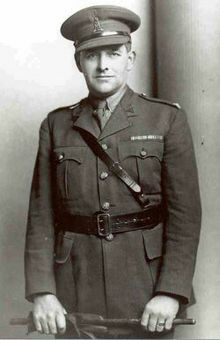 The announcement was made in The London Gazette and his parents received his posthumous VC from King George V in July. The VC was handed on to Ernest’s brother, Harold, on the death of his father and the campaign medals to his fiancée, May Bundy. The medals were loaned to the Green Howards Museum in 1964 and finally bequeathed in July 1973. They are on display at the Museum, which is at Richmond in Yorkshire. 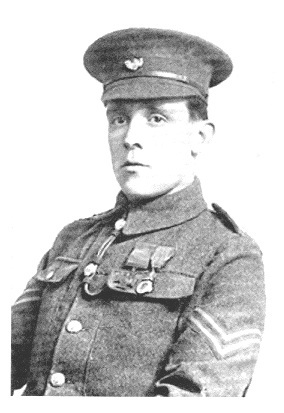 The final VC of the First World War was awarded to Private Frank Lester, a former member of the 1st Hoylake Company. 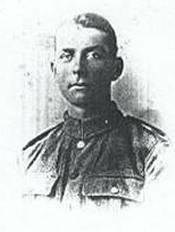 Frank Lester was born on 18 February 1896 at Huyton, Liverpool and joined The South Lancashire Regiment in March 1916 and was soon promoted to Sergeant-Instructor, training troops at Press Heath Park and Kinmel Park. In June 1917 he transferred to the 10th Battalion, Lancashire Fusiliers, reverting to the rank of private as was normal when proceeding overseas. He travelled to France with his regiment in December 1917, was wounded and hospitalised in March 1918, returning to England in July and being stationed at Cromer on the North Norfolk coast. Returning to France in September 1918 he was to win the Victoria Cross on the 12 October 1918, sadly being killed by a German sniper in the process. The citation reads: “For most conspicuous gallantry and self-sacrifice during the clearing of the village of Neuvilly, near Le Cateau, on 12 October 1918. With a party of seven men under an officer, Lester was the first to enter a house by the back door, shooting two Germans as they attempted to escape by the front door. A minute later a fall of masonry blocked the door by which the party had entered. The only exit into the street was under fire at point-blank range, the street also being swept by machine-gun fire at close range. Observing that an enemy sniper was causing heavy casualties to a party in a house across the street, Private Lester exclaimed "I'll settle him" and, dashing out into the street shot the sniper at close quarters, falling mortally wounded at the same instant. Frank Lester well knew it was certain death to go into the street and the party opposite was faced with the alternative of crossing the fire-swept street or staying where it was and being shot one by one. To save their lives, Lester sacrificed his own." As well as the Victoria Cross won by Frank Lester on this day, the 10th Battalion was also awarded two Military Crosses, one Distinguished Conduct Medal and three Military Medals for action in and around Neuvilly. Private Frank Lester VC is buried in the Neuvilly Communal Cemetery Extension, 3 miles north of Le Cateau, Row B, Grave 15. His name is also on the family grave at Holy Trinity Churchyard, Hoylake. His Victoria Cross was recently sold at auction by the London auctioneers Morton & Eden for £78,000. 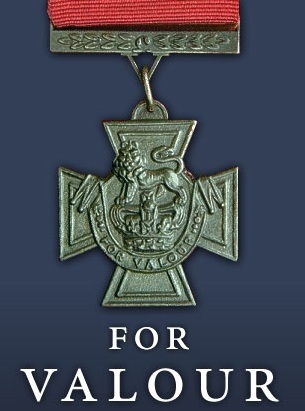 The VC was purchased on behalf of the Michael Ashcroft Trust, the holding institution for Lord Ashcroft's VC Collection. It is planned that the whole of Lord Ashcroft’s collection will be displayed in a special gallery at the Imperial War Museum, London, in 2010. Four awards of the Victoria Cross were made to former members of The Boys’ Brigade during the Second World War. The first was made on 15 September 1940 to Flight Sergeant John Hannah whilst serving with 83 Squadron, Royal Air Force. 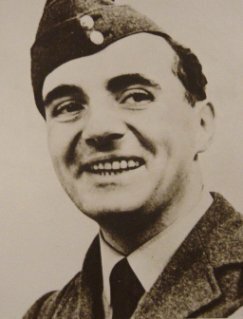 John Hannah was born on 27 November 1921, and was a member of the 237th Glasgow Company. At the time the action took place, he was 18 years old, and became the youngest recipient of the VC for aerial operations. After a successful attack on German barges, the Handley Page Hampden bomber in which Flight Sergeant Hannah was wireless operator/air gunner, was subjected to intense anti-aircraft fire over Antwerp, Belgium. This started a fire which spread quickly and forced the rear gunner and the navigator to bale out. Flight Sergeant Hannah could have acted likewise, but instead he remained to fight the fire, first with two extinguishers and then with his bare hands. He sustained terrible injuries, but succeeded in putting out the fire and the pilot was able to bring the almost wrecked aircraft back safely. He contracted tuberculosis only a year later in mid to late 1941, brought on no doubt by his weakened condition following the severe burns he sustained during the action. This necessitated his eventual discharge, with full disability pension, from the RAF in December 1942; however, unable thereafter to take up a full-time job, he at first took a job as a taxi driver but due to failing health he was unable to continue in this job. He then found it increasingly difficult to support his wife and three small daughters and his health ultimately gave out. His Victoria Cross is on display at the Royal Air Force Museum at Hendon, London. 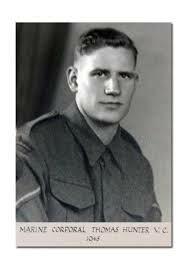 The first VC to be awarded to a former member serving in the Far East was awarded to Acting Sergeant Hanson Turner of the West YorkshireRegiment (The Prince of Wales's Own) on 6/7 June 1944. Hanson Victor Turner,who was born on 17 July 1910, was a former member of the 6th Halifax Company, and was33 years old at the time of the action. The citation for the award reads: “In Burma, at Ningthoukong on the night of 6/7 June, 1944, an attack was made by Japanese with medium and light machine guns. The attack largely fell on the position held by a platoon of which Acting Sergeant Turner was one of the Section Commanders. The enemy were able to use grenades with deadly effect, and three machine-guns in the platoon were destroyed and the platoon was forced to give ground. Acting Sergeant Turner with coolness and fine leadership reorganised his party and with a doggedness and spirit of endurance of the highest order repelled all attacks. The position was held throughout the night. When it was clear that the Japanese were attempting to outflank the position, Acting Sergeant Turner, armed with grenades, boldly and fearlessly attacked them single handed. He went back five times for more grenades; and on the sixth occasion, still single handed, he was killed while throwing a grenade among the enemy. His conduct on that night will forever be remembered by the Regiment. His superb leadership and undaunted will to win in the early stages of the attack was undoubtedly instrumental in preventing the enemy plan from succeeding. The number of enemy found dead the next morning was ample evidence of the effect his grenade throwing had had. He displayed outstanding valour and had not the slightest thought of his own safety. He died on the battlefield in a spirit of supreme self-sacrifice". Although Hanson Turner was originally member of the Duke of Wellington's Regiment, he was serving with The West Yorkshire Regiment (The Prince of Wales's Own) when he was awarded his VC. When his medal was put up for sale at auction, it was purchased by the Halifax Town Council, as he was a local Halifax resident. It is displayed in the Halifax Museum in West Yorkshire. The only naval award was made to Temporary Corporal Thomas Hunter of the Royal Marines. Thomas Peck Hunter was born on 6 October 1923 and was a member of the 67th Edinburgh Company. At the time of the award, Thomas Hunter was 21 years old. He was awarded the VC for his actions during Operation Roast. On 2 April 1945 at Lake Comacchio, Italy, Temporary Corporal Hunter, who was in charge of a Bren gun section, offered himself as a target to save his troop. Seizing the Bren gun, he charged alone across 200 yards of open ground under most intense fire towards a group of houses where three Spandau machine-guns were lodged. So determined was his charge that the enemy soldiers were demoralized and six gunners surrendered. The remainder fled. Hunter cleared the house, changing magazines as he ran and continued to draw enemy fire until most of the troop had reached cover, Hunter was killed, firing accurately to the last. 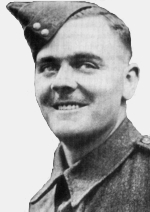 Danish national, Major Anders Lassen of the Special Boat Service (SBS) was also awarded a VC posthumously in the same action. His Victoria Cross is displayed at the Royal Marines Museum at Southsea, near Portsmouth. 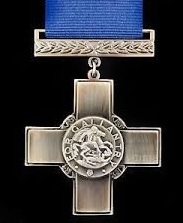 The final award was in fact the last Victoria Cross to be awarded during the war in Europe. It was to Guardsman Edward Charlton of the 2nd Battalion, Irish Guards. Edward Colquhoun Charlton was born on 15 June, 1920, and was a member of the 32nd Manchester Company. On 21 April 1945 at Wistedt, Germany, Guardsman Charlton was a co-driver of one tank of a troop which, with a platoon of infantry, captured the village. The Germans soon attempted to re-take the village with numerically superior forces, which largely consisted of officer cadets under the command of their very experienced instructor officers as well as two or three self-propelled guns. Three of the four tanks of the small Irish Guards force were badly hit, the fourth (Charlton's) being disabled by a complete electrical failure before the action started. When the tank was disabled, Guardsman Charlton was ordered to dismount the turret Browning machine gun and support the infantry. Charlton, on his own authority, as the Irish Guards became increasingly in danger of being over-run by the Germans, took the machine gun and advanced in full view of the attacking Germans, firing the weapon from his hip as he did so and inflicting heavy casualties on the Germans, halting the lead company and allowing the rest of the Guards a brief respite to reorganise and retire. He continued his bold attack, even when he was wounded in his left arm. Charlton managed to find the strength to place the machine-gun on a fence where he launched a further attack before his left arm was completely shattered by further enemy fire. Charlton, now with just one arm, carried on his astonishing attack until a further wound and loss of blood resulted in the Guardsman collapsing. His courageous and selfless disregard for his own safety helped save the precarious situation that the Irish Guards faced". He later died of the wounds he had received, and was awarded a posthumous Victoria Cross. Unusually, much of the citation was based on German accounts of the fight as most of his later actions were not witnessed by any of the Guards officers or surviving non-commissioned officers. His Victoria Cross is displayed at the The Irish Guards Regimental Headquarters in London. In recognition of his gallantry, the Manchester Battalion of The Boys’ Brigade present the Charlton Bible to the winner of the Battalion’s Scripture competition. The Manchester Stedfast Association have purchased a replica of Guardsman Charlton’s Victoria Cross and presented it to the Battalion. It will be placed in the archives of the North West District at the Leadership Training Centre at Treales, near Lytham St Annes. Graham Parish GC was originally from Sheffield where he had been a member of 8th Sheffield BB Company. Prior to enlisting with the Royal Air Force Volunteer Reserve in August 1940, he had been employed as the Borough Librarian for Lytham St Annes at the St Annes-on-the-Sea Carnegie Library. Sergeant Parish, RAF, was the navigator of an aircraft during a delivery flight from the United Kingdom to the Middle East Command. Shortly after taking off from an airfield in Anglo-Egyptian Sudan one morning in September, 1942, the port engine failed and the pilot attempted to return and land on the airfield. Owing to the rough nature of the ground, full use could not be made of the brakes. The aircraft struck a building on the airfield and immediately burst into flames. All of the crew with the exception of Sergeant Parish and a passenger, whose legs were both broken, succeeded in getting free of the blazing bomber. At the time of the crash Sergeant Parish was at the astro-hatch and the passenger was at the emergency door which is in the floor of the fuselage. This door was unusable as the undercarriage had collapsed and the fuselage was resting on the ground. The fire, which completely destroyed the bomber, was so intense that no assistance could be given to the navigator or the passenger. When the blaze subsided Sergeant Parish's body was found leaning against the rear gun turret and the passenger was beside him with his arm over the airman's shoulder. As the passenger could not walk, owing to his broken legs, it is clear that Sergeant Parish had carried him from the .emergency door to the rear turret, a distance of eight yards, in the hope that both could escape through the turret. Undoubtedly both were overcome and burned to death in the attempt. Sergeant Parish could have made his escape through the astro-hatch but his unselfish desire to assist the passenger, cost him his life. He displayed gallantry of the highest order.